This is Malen and I will share with you my story. Tim, I thought, was the golden goose who will save me from long drought and famine. I met him in the blogosphere last year. Yes, Tim is a seasoned blogger. I was practically glued to his blog the first time I read it. I find his words very engaging, and his humor is kinda like satirical to some yet to me, he really is a funny person. He is a writer slash pilot slash part time real estate agent. He was such a nice young looking old man, very sweet and yes, talks about smart things all the time. We’ve become really good friends. We would talk everyday through email, YM and over the phone. It was such a relationship that’s very expensive to maintain. Days, weeks and months passed by, the friendship grew into something special. In my heart, I can’t contain anymore the love I was feeling. It was overflowing, overwhelming and indeed, such a wonderful thing. Call it love in the times of blogging. 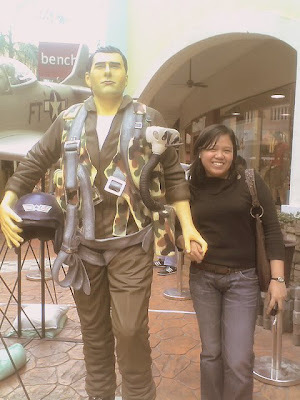 Last Feb 14, which was already very romantic, at last, my prince charming has landed! He came all the way from UK riding his OWN chartered plane! It wasn’t really planned and we never talked about having an EB somewhere in Eastwood City. He surprised me with a visit and I was extremely shocked I could die that moment! And when we first laid eyes on each other, suddenly, there were sparks and fireworks all over. MAGICAL. That look in his eyes was telling me how much she adored me. We spent the whole day enjoying each other’s company, you know…labing labing sa Eastwood ba…and then he blurted out that since the trip wasn’t planned (how sweet di ba), he actually did not bring any clothes with him(awwww!) and he left his money and credit card back home too so I had to pay for our lunch at Le Souffle. Nag-shopping pa kami sa Bench. And since it’s dyahe if I’ll let him sleep in my old rugged house with my old rugged bed…I had to bring him to the Ascott Makati Hotel. Guess what, he forgot his laptop as well so I had to let him barrow my new MacBook Air. I had to file for 15- day emergency leave in the office. Later that day, we were touring the Philippines via his airplane along with 2 of his colleagues. We went to Coron, Palawan for 5 days. Beach bumming for 3 days in Boracay. Went to Cagayan de Oro for wild water rafting. Skim boarding at Siargao. Scuba diving in Bohol. Snorkeling in Batangas. Strolling in Batanes. It was an all-expense paid trip by my credit cards!!! What can I do? I was in love then. Besides, he’ll payback and will send the money through my paypal kaya I kept all those receipts and made note on all our expenses. After the many days of touring the beautiful island of the Philippines, his airplane was already out of gas. Exactly how much fuel does it take to fly a chartered airplane? It needs about 100,000 to 500,000 pounds of fuel but I can only afford sixty thousand pounds, which is equal to 9000 gallons of octane fuel, again, slashed from my 5th credit card!!! And then one morning, I woke up not seeing his presence anymore. He left Manila without saying goodbye to me at all. He stole my MacBook Air, my stilletos, my Dior shades, my wallet and my 34.000P earned from paid blogging!!! Pay back dude! Pay me or else! I almost believed it. I called the embassy in the UK and searched for you. I searched and stalked your friends on myspace, multiply and friendster…. I even called the real estate company you’re working for and guess what? They were all saying the same thing – you need money and all for the laparoscopic surgery and medication you need! That hospital and the real estates both played major roles in this scam ever ever!!! You scammer! I don’t freaking care about your condition. Send me proofs/evidences at least. He’s called up yesterday and he’s again trying to scam me. You think I was that same stupid person who’s still in love with you? DEAD WRONG! He was never confined. He was attempting to slash $$$ from me again. Tim along with the doctors and nurses in that UK Hospital is trying to scam me. You scammed me with so much already…how do I get the money back??!!! Western Union? My life is now shattered. PAY BACK!!!! People, beware of this person. He can ruin your life. Be careful guys with the people you meet on the internet. They too will scam you, your credit cards and your savings!!!! That’s an attempt to alter the hoax scam stories accusing the Filipinos and the Philippines in general as scammers!!! Let’s all fight this ‘someone’ who is shaming you and me and the entire brown race! Ladies and gentlemen and in betweens, don’t be fooled, Tierra maria estates scam, Tierra Maria UK scam and hospitals scam philippines are all hoax stories. Please read these articles: Was there a scam – Part 2 and Was there a scam – The Motive for more information. and also I suggest that your title should be “Hospital Scam Hoax” or “Tierra Maria Estates Scam Hoax. Your reward? Well, wala! LOL. It’s social climbing for a great cause! ang galing ng bersyon mo ha, mas mayaman si tim mo, hahaha – ako trisikad lang ikaw jetplane!